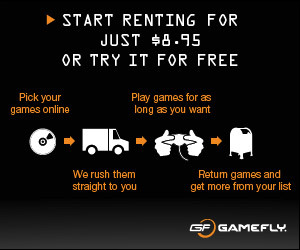 As a GameFly member, you can rent as many games as you want and play them as long as you want for only $22.95 per month. Manage your own personal wish list of games, what they call “My GameQ.” Check out 2 games at a time. When you’re done, send your games back to them and the next picks in your GameQ will automatically be sent to you. Try GameFly today for 10 days FREE! Stop wasting money buying games that just sit in your cabinet and rent them from GameFly.